Taste of Christmas is the UK’s biggest Christmas food festival. Some of the world’s finest and award-winning chefs will be teaching and inspiring visitors with festive tips and tantalising Christmas dishes to re-create at home. A feast of modern street food will be on offer including The Bowler, serving mouth watering meatball dishes, Hix’s Fishdog offering a modern take on the fish finger sandwich, Yalla Yalla’s authentic Lebanese and Middle Eastern street food and Jamie Oliver’s Great British Artisan Hot Dogs from Union Jacks. 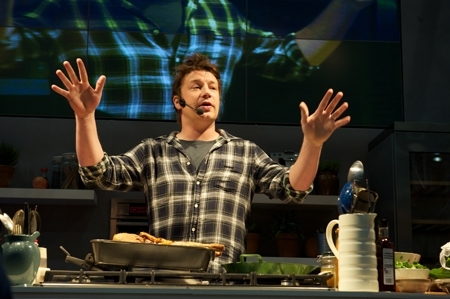 World renowned chef Jamie Oliver will also be opening the festival on Friday 7th December, and will be hosting live cooking demonstrations of seasonal and delicious recipes to try out for yourself this winter. Also world’s top chefs including; Michel Roux Jr, Jean Christophe Novelli, Valentine Warner, The Baker Brothers, Ben Tish, Vivek Singh, Mary Berry, Rachel Allen and Bruno Loubet will all be demonstrating live at the Electrolux Taste Theatre. Some of our favourite London restaurants, including the Latin American Lima, gourmet French bistro Comptoir Gascon, modern Spanish tapas bar Salt Yard and contemporary Indian restaurant Cinnamon Soho will also be at the festival cooking up some fantastic and varied international-cuisine. Additionally for those looking to stock up on their culinary Christmas shopping, the festival boasts over 250 fine food and boutique market stalls selling handmade gifts and culinary presents. Taste of Christmas 2012 takes place from 7-9 December at ExCeL London from 10am to 6pm daily. Tickets are priced from £18.50. For more information visit www.tasteofchristmas.com.